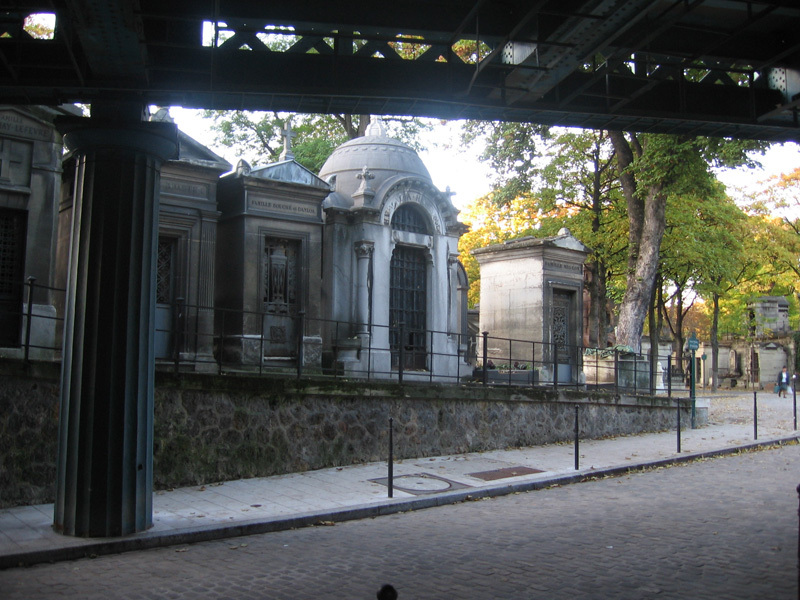 I've put off writing about Paris' big cemeteries for years now! The topic is so huge and so dear to my heart; where to begin?! How can I possibly do it justice?! It's kind of like that novel you're going to write; you'll be ready someday. Well, the truth is, you will never be ready for that novel, and I will never be ready to write about these gorgeous cemeteries, so we just need to do it. NOW. I will if you will. Deal? 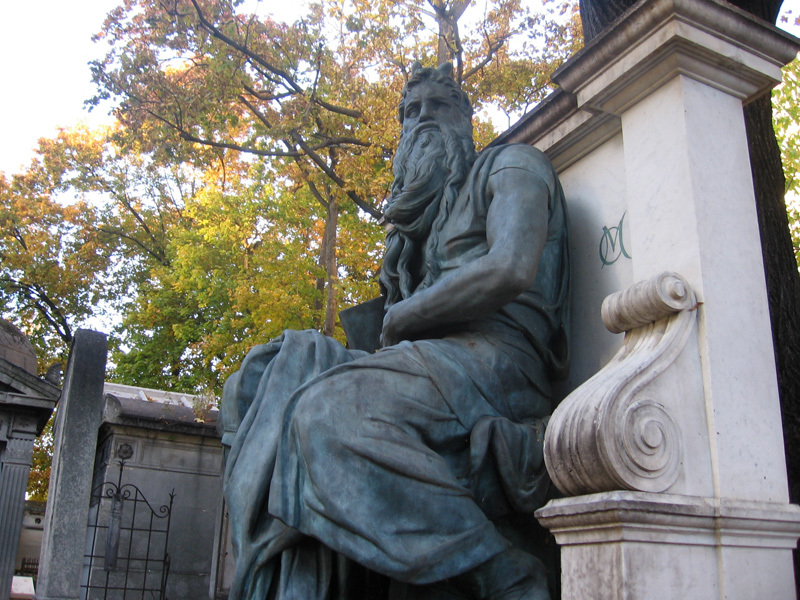 I'm starting with the Cimetière de Montmartre. 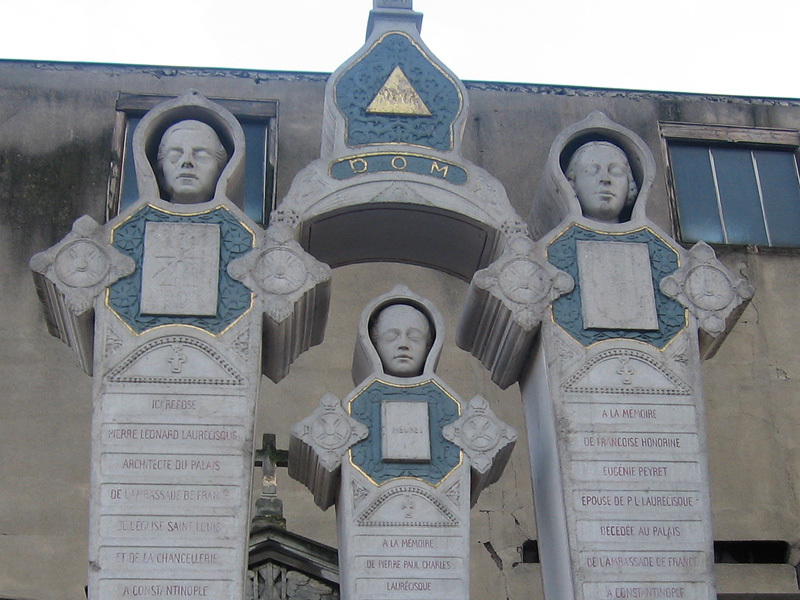 I lived very close to this cemetery for years and visited all the time; it's the third largest of Paris' cemeteries, it's the one I know the best, and it's absolutely my favorite. Le Cimetière de Montmartre is slightly less beautiful and gloomy than the more famous Pere Lachaise, but more so than Montparnasse, and it's enormous and usually extremely empty and quiet, which I love. 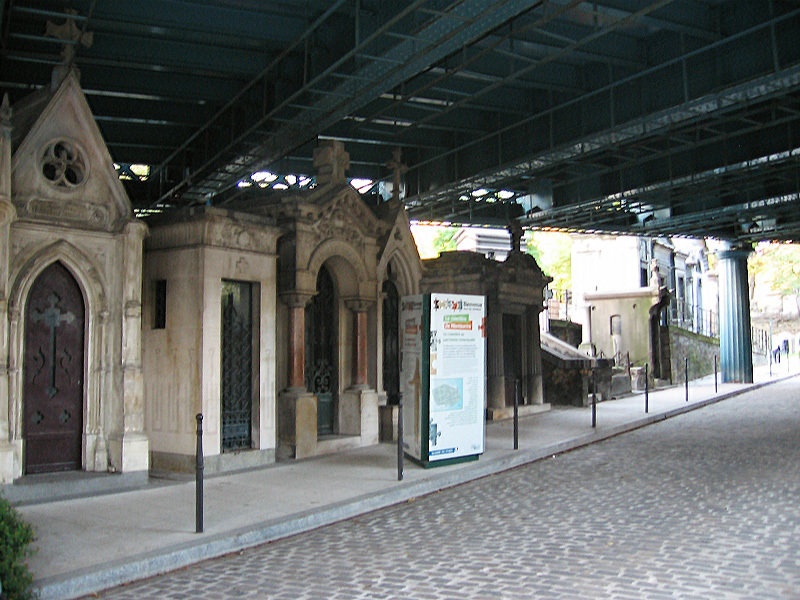 A neat detail: long after the cemetery was built, the city added an overpass that goes right over top of the cemetery (it's Rue Caulaincourt) and you can walk over and look down onto the tombs; I recommend you approach the cemetery this way. 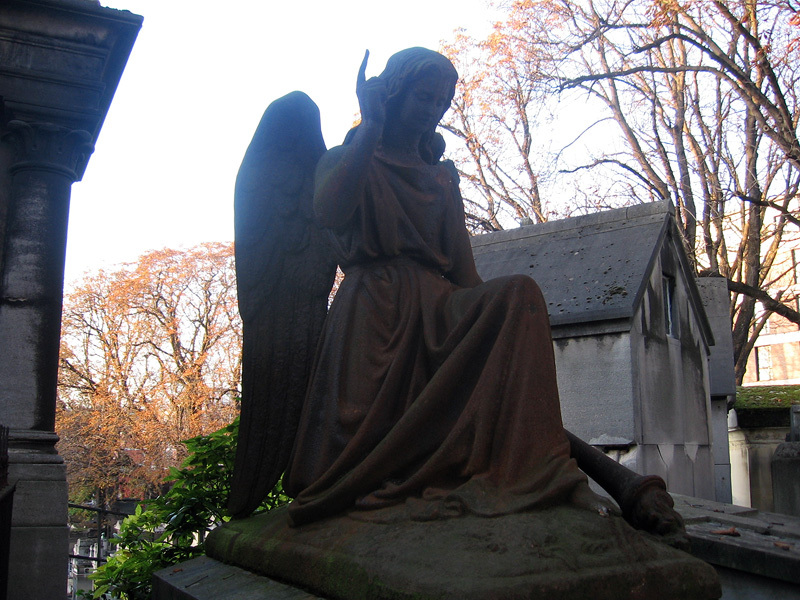 Work in your visit to the cemetery on a morning/afternoon when you're strolling around Montmartre. Take the Rue des Abbesses toward the West, and eventually you'll hit a fork in the road with a weird ivy-covered restaurant called Le Basilic. Go to the left of this restaurant and you're now on Rue Joseph de Maistre. (By the way, if you take a detour to the right of the fork for just one minute, you can see Van Gogh's old apartment up at 54 Rue Lepic, and then come back and continue here.) 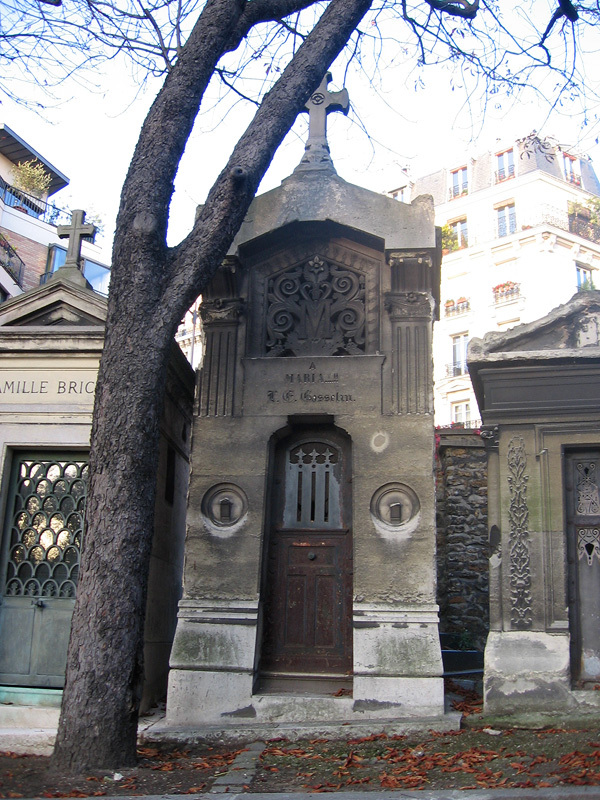 Rue Joseph de Maistre intersects with Rue Caulaincourt very soon, and you'll see the low walls of the cemetery in front of you and to the left. Turn left onto Rue Caulaincourt here and you're now on the overpass that goes directly over the Cimetière de Montmartre. From this bridge, you can look down and see tons of tombs, and many others that are built up on large terraced areas that are even with the overpass; some are even higher. When you reach the end of the bridge, there's a stairway that goes down to the left. Take this, and the entrance to the cemetery is right there; you can't miss it. 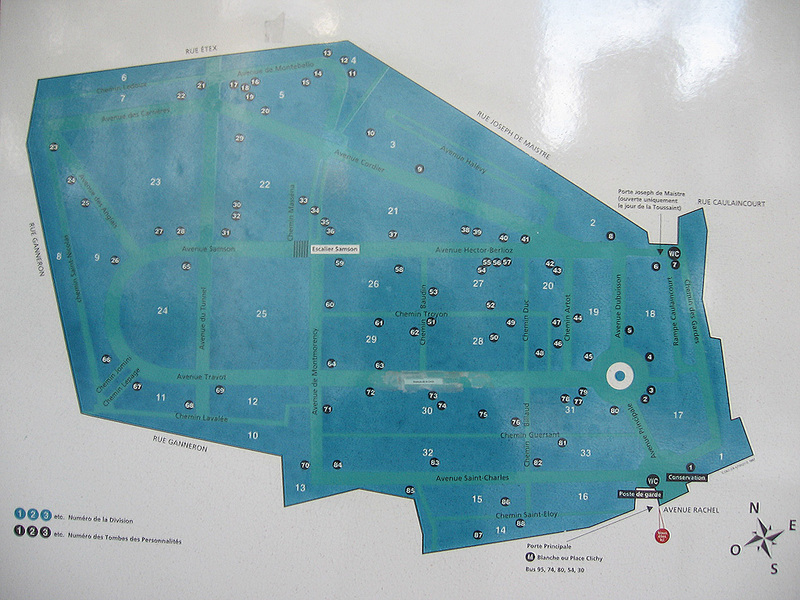 Here, I've made a map of this whole walk from Rue des Abbesses to the cemetery entrance; just follow the blue line. A faster way to get there would be from Métro Blanche but then you'd miss the overpass, plus the nice Montmartre stroll along the Rue des Abbesses. 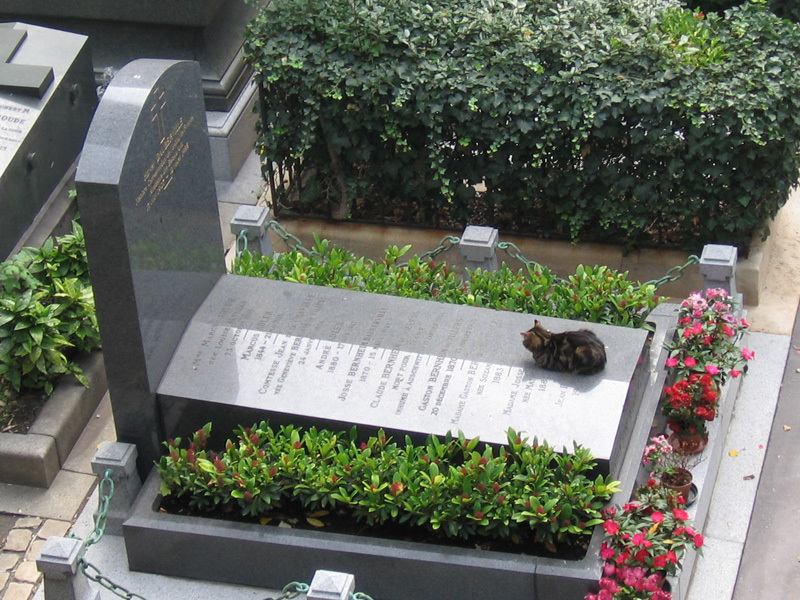 Next to the map is the list of names of famous French (and other) people who are buried here. Le Cimetière de Montmartre doesn't have a ton of famous people (or, I should say, people who are famous to an American/anglophone such as myself) but the map will help get you oriented. Once you're done with the map you can continue ahead and see a lot of large, older tombs, many of which go right up into the scaffolding of the overpass! They built the thing so incredibly close to the tombs that it seems downright disrespectful to me, but these people have been dead for ages, so I guess nobody cares. Let's start with the huge section on the left. Follow your way toward that large white circle on the map; you can't miss it. 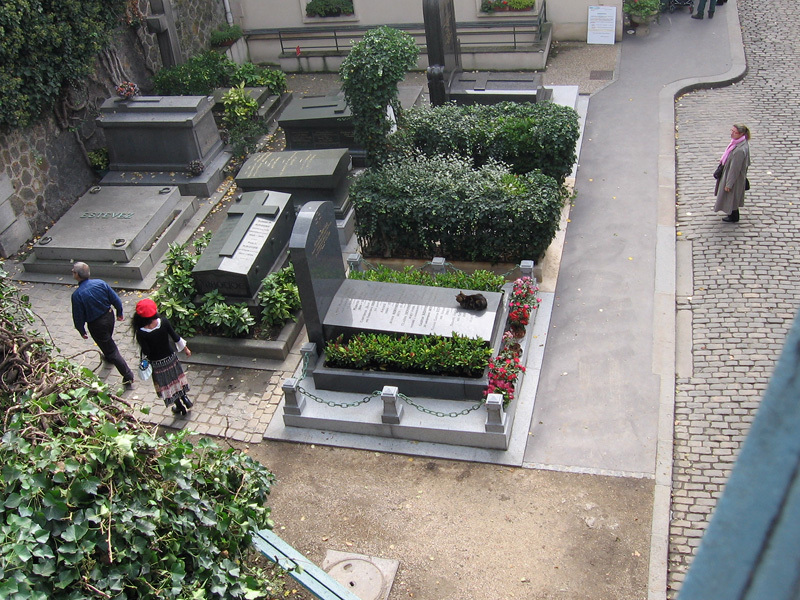 At the edge of that circle, up ahead, is the (empty) tomb of Émile Zola (above). 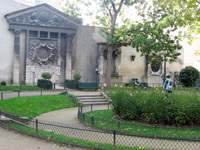 He was originally interred here and later moved to the Panthéon. 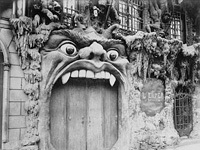 As an American I didn't know much about Émile Zola before I moved to France, other than his name and the title of his most famous work, J'accuse; I couldn't have told you anything else about him or his writings. However, it's really worth your time to read about him and the Dreyfus Affair if you're not familiar. 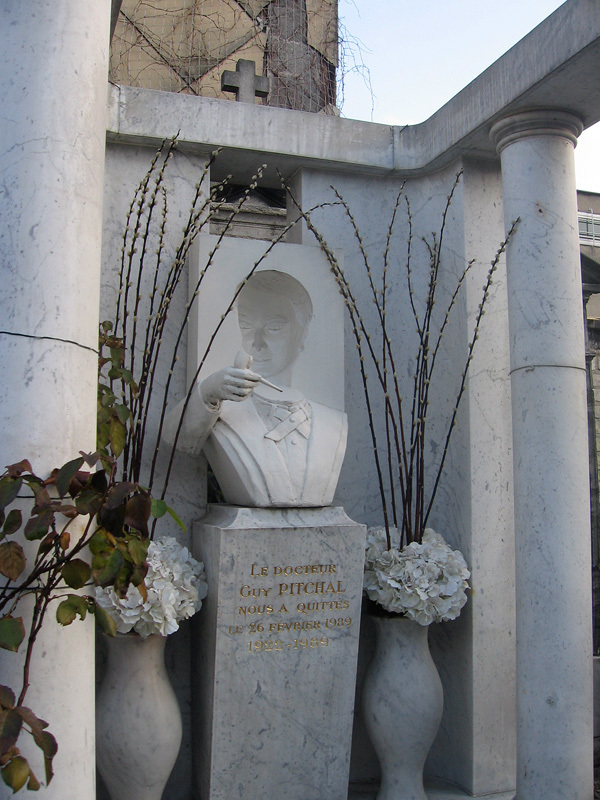 I wrote a blog post about Capitaine Dreyfus and his statue a while back. 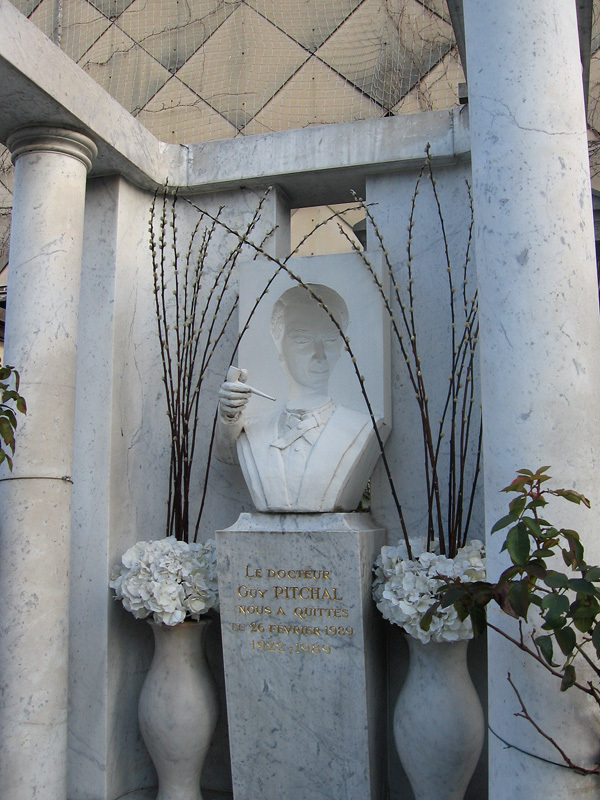 Dreyfus himself, incidentally, is buried in the Cimetière de Montparnasse, but that's an article for another day. 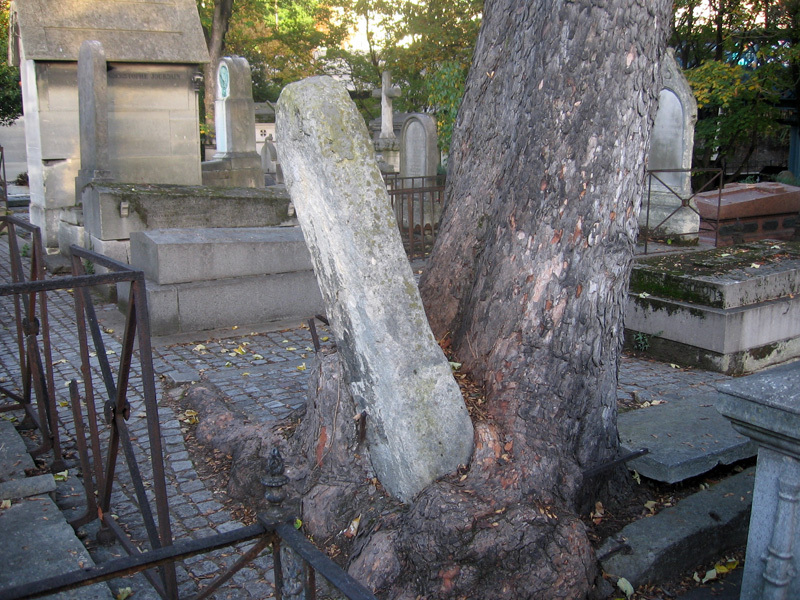 This tree has grown completely around a tombstone. I blogged about it a while back (with a few more pictures) here. 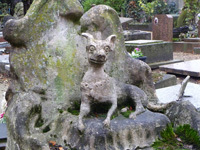 Dapper little fellow somewhere behind Émile Zola's tomb. Uh, it looks like maybe someone was trying to bust outta this one. 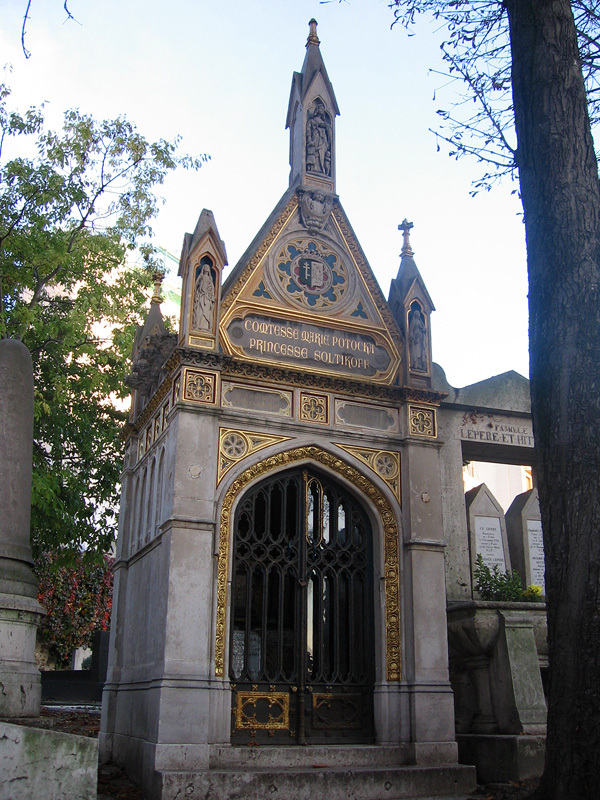 This ornate tomb (above) of Comtesse Marie Potocka aka Princess Soltikoff is my second-favorite in the Cimetière de Montmartre (my favorite is absolutely crazy, and it's coming up near the end of this article). I blogged about this tomb ages ago, here, and expressed my confusion about who exactly was in here, and some extremely helpful people chimed in in the comments and filled in some gaps and provided some interesting links; check it out! 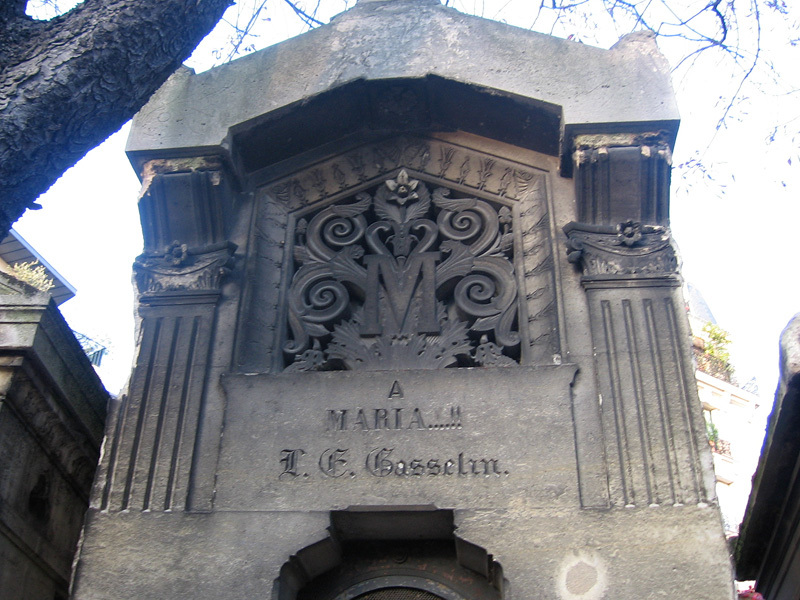 I'm so intrigued by the inscription on this tomb! That crazy punctuation! The first part is probably "À Maria....!!" meaning "to Maria" — with capital letters in French you're allowed to drop the accent marks above. I guess it could also possibly be "A. Maria....!!" as in the first initial A followed by the name Maria, but this seems unlikely, as there's no period, and the initials below do have periods. In any case, the four periods and two exclamation marks at the end are extremely strange, as is the fact that the "A" and "Maria" are different typefaces. I've never seen anything like it. Then there's the next line. That medieval typeface is hard to make out, especially those first two letters, and I actually just did a little research/trial and error on DaFont.com, browsing through their medieval fonts, to determine that this name is almost certainly "L.E. Gasselin." The frustrating part result of all of this is that a Google search for any combination of "L.E. Gasselin" and "À Maria....!!" 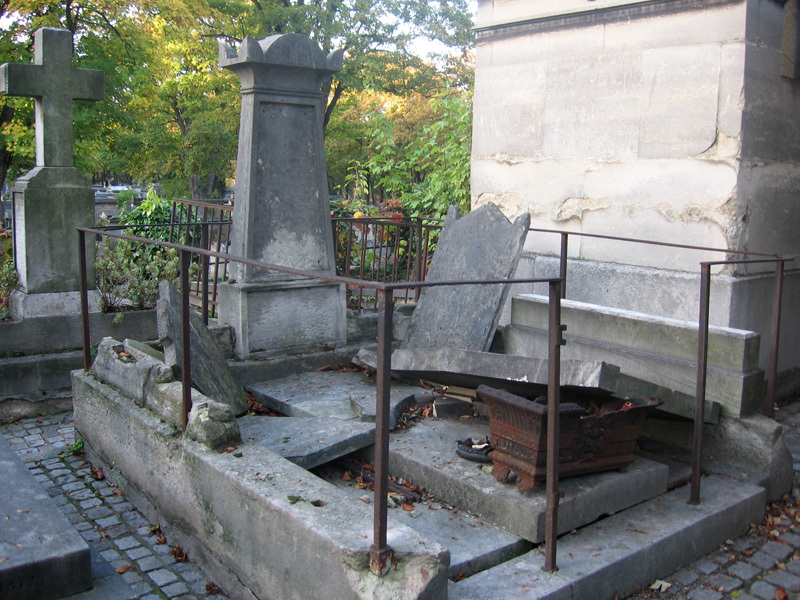 and "Cimetière de Montmartre" turned up absolutely nothing. So this one is a complete mystery to me. Anyway, on to more stuff! I love this smooshed-head guy! 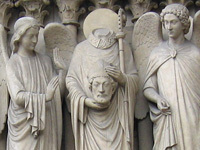 It looks like his head must've gotten knocked off and probably kicked around a bit before someone working at the cemetery simply propped it back up. 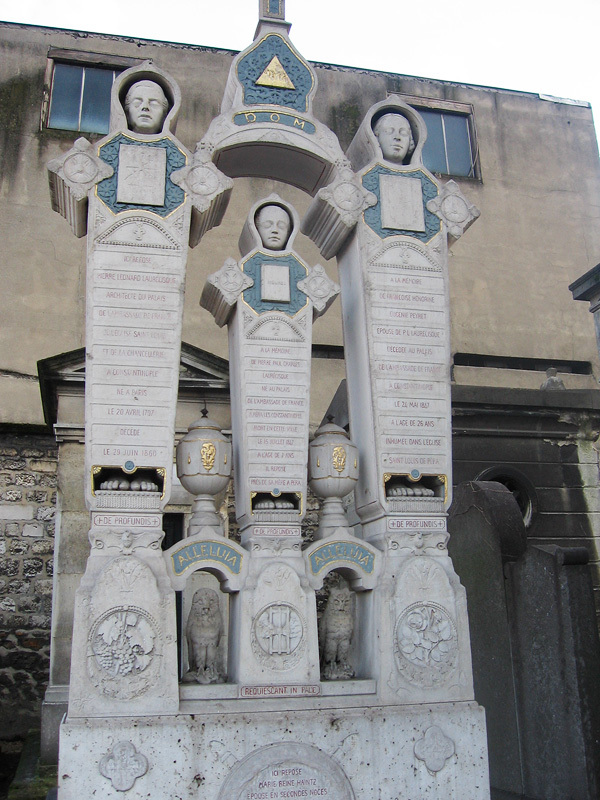 I blogged about this tomb a while back (with some more detailed pictures), here. 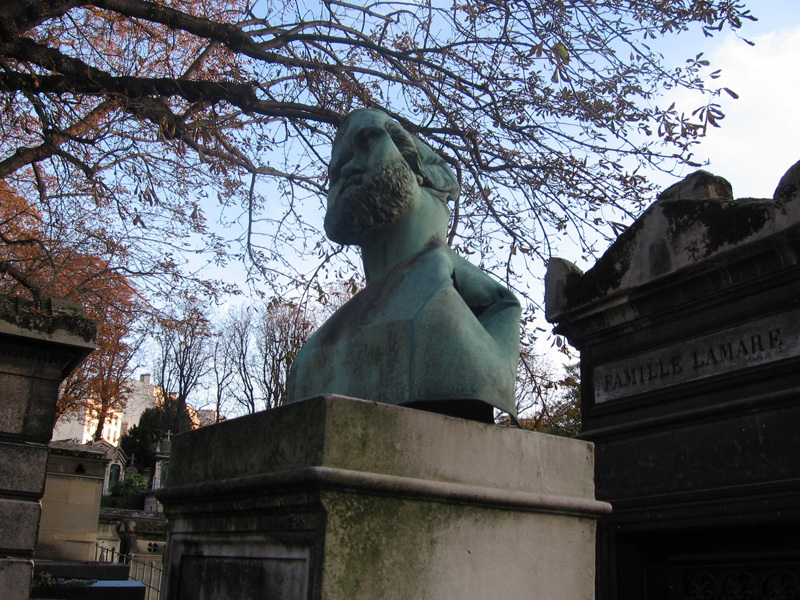 The first time I saw this tomb I assumed the head would be repaired or removed shortly thereafter, but every time I go back to the Cimetière de Montmartre he's still sittin' there lookin' all busted. 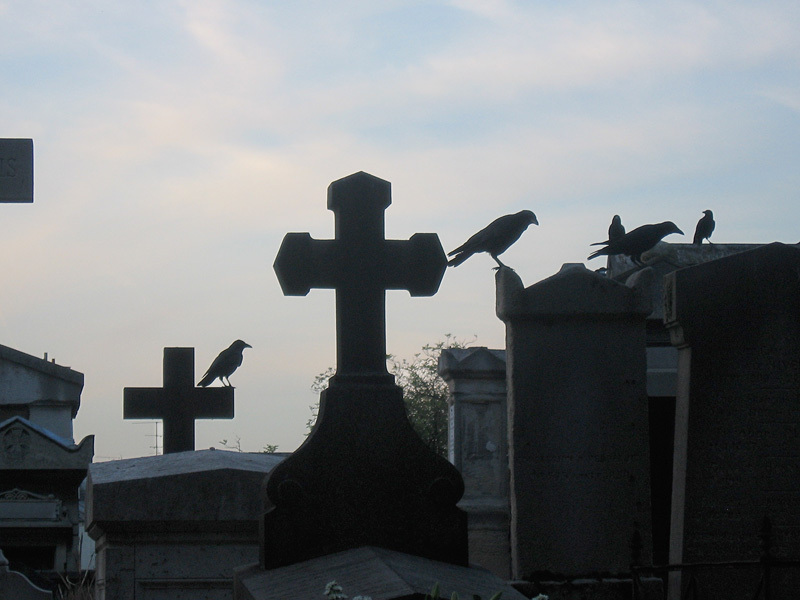 One time I was at the Cimetière de Montmartre and all these crows were hanging around on some tombs, cawing at each other. This is probably the spookiest picture I've ever taken. Eventually you'll find yourself winding back toward the overpass and the entrance. Near the main entrance there's a stairway going up to one small but fascinating part of the cemetery you haven't seen yet. You need to get up there, seriously, for these next two weird things. Whoa! I have absolutely no idea what's going on here! Deceased family standing up in their coffins — check. Pyramid and other probably-masonic symbols — check. Bats at the bases of the coffins — check. Owls; a symbol of death and doom since Roman times — check. This is perhaps the coolest tomb in the universe, and it is absolutely my favorite in this cemetery. This guy's face is inverted, creating the optical illusion that his gaze is following you as you walk by! Neat! A little bit beyond these two weird tombs is the tomb of one more celebrity: Dalida, a beloved Italian/Egyptian singer who enjoyed the most successful part of her career in France in the 60s/70s. As I myself am an American/anglophone, I had never heard of her before I moved to Paris, but she is absolutely legendary here. I recently blogged about a monument/bust of Dalida near her old Parisian home at Place Dalida, and you can see a couple pictures of that here. 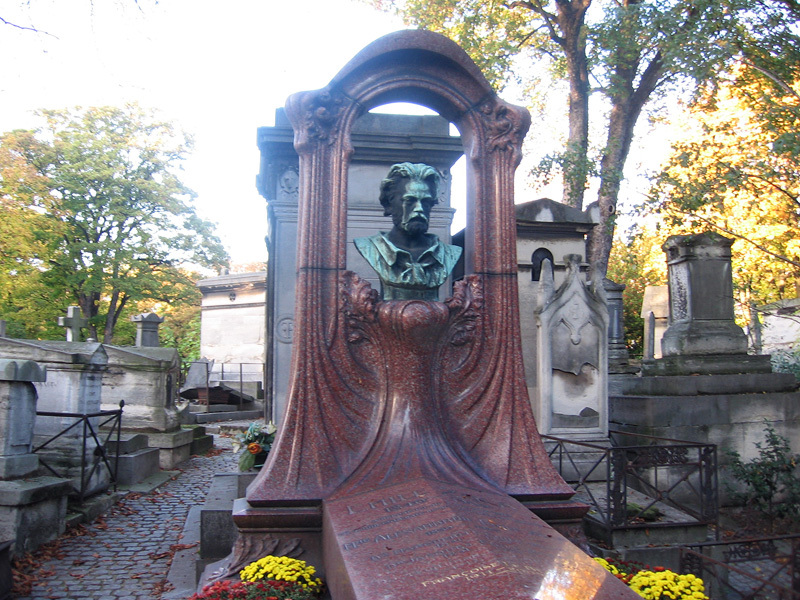 Unfortunately I don't have a picture of her tomb in the Cimetière de Montmartre, so you'll just have to come visit it for yourself! It's so tempting to imagine he or she is mourning a lost loved one! Here, listen to Bang Bang by Dalida while you contemplate mortality and sad kitties. 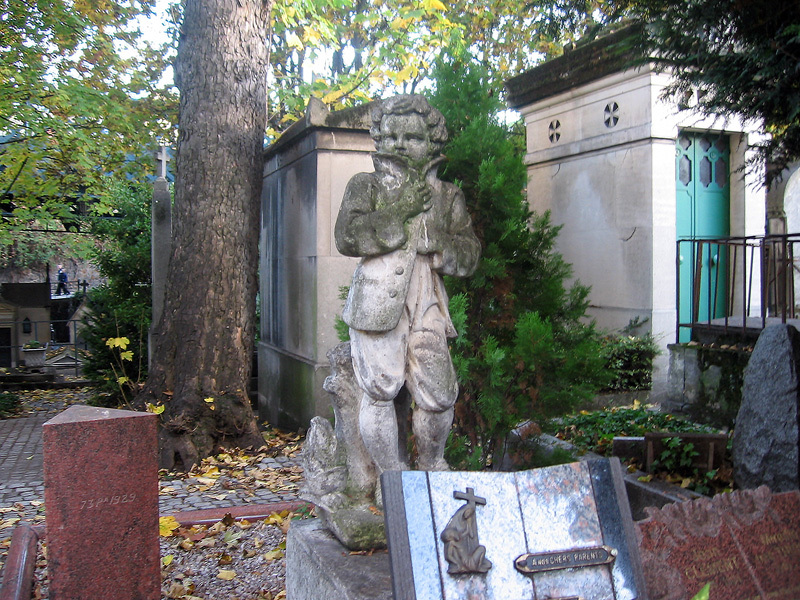 Okay, that's all I've got for the Cimetière de Montmartre! I hope you'll enjoy it as much as I do! 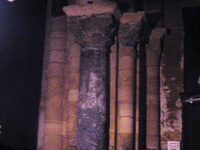 Church containing 7th century Roman columns.